When will the wicked be destroyed in hellfire? The Bible tells us the Lord knows how to reserve the unjust unto the day of judgment to be punished. How to do what? To reserve the unjust unto the day of judgment to be punished. They're being reserved. Furthermore, you can read the second part of the answer, Jesus said in John 12:48, "The word that I have spoken, the same shall judge him in the last day." Now friends, I want to go to the Bible quickly. I read all these scriptures as an adolescent, I like holding the book. I'd like to show you something. Turning your Bibles with me to the Gospel of John, chapter six. I wanted to read some of this last night, my problem is I have far more scripture than time to share the scripture. People who think you die and go right to heaven, before judgment, before the resurrection, they need to read what Jesus says, just in this chapter, for instance, page 1558 in the seminar Bible, John chapter 6, verse 39, "And this is the Father's will which has sent me, that of all that he has given me, I should lose nothing, but I should raise it up again at the last day." You read here, verse 40, "And this is the will of him that sent me, that everyone that sees the Son, that believes in him, may have everlasting life and I will raise him up as soon as he dies." No, I'll raise him up at the last day. You can read verse 44. "No man can come to me, except the Father which has sent me, draw him, and I will raise him up at the last day." Verse 54, "Whoever eats my flesh, and drinks my blood, has eternal life, and I'll raise him up at the last day." I'm not done yet. Go with me to First Corinthians, chapter 15. Just wanted to make it really clear, because last night's study dealing with the dead, and when they're resurrected, and the subject of hell, it's very important for you to know when do people get their rewards. We'll know if people are burning in hell now. First Corinthians, chapter 15, verse, let's start with verse 22. That's page 1687. "For as in Adam all die." We all have the sinful nature we inherited from Adam, but thank goodness we, through Christ, can get the victory over that. "But every man in his own order," I'm sorry, "In Christ shall all be made alive." Verse 23, "But every man in his own order." Here is the order. "Christ, the first-fruits," Jesus rose already. Afterward, what? "Afterward they that are Christ's," When? "At his coming." When are they going to rise? The last day, afterward, at his coming, when the trumpet blows, when the Lord descends, is it clear to you they're not risen yet? Say Amen if you understand that. Now, there's a parable that I want to draw your attention to, you can find in Matthew 13, verse 40 approximately. Jesus talked about a man who had a field, and he put good seed in the field. He planted wheat, but an enemy came, and he sowed, he planted tares. That's like a weed, when it's small, it resembles wheat. When everything sprouted, the servants said, "Look, we found that there are tares among the wheat. Do you want us to go pull it up?" He said, "No, let it grow together till the harvest time." Revelation, Jesus is seen coming with a sickle to harvest the earth, okay? It says then, at the end, we'll do the harvest. Now, you can read here in Matthew 13, verse 40 to 42, Jesus says that this is how it's going to be with the wicked at the end of the world. "As therefore the tares are gathered and burned in the fire, so shall it be in the end of this world. The Son of man shall send forth his angels," It says, "They shall gather them which do iniquity, and cast them into a furnace of fire." All right, did you catch that? When are they gathered and burned? The end of the world. This is what Jesus said. Who is burning in hell now? All right. Now, I got to stop and talk to you for just a minute, and I need both of my hands to talk. 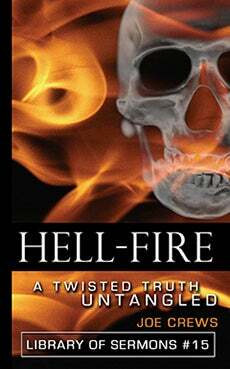 There are two extremes that people err on when it comes to the subject of hell and the lake of fire. One extreme is that God is a tyrant, that as soon as people die, they are plunged into this molten lake of fire and brimstone, and the devil's in charge, and he has a pitchfork to keep pushing you under to make sure you get cooked evenly. People are writhing, and shrieking, and screaming in unutterable agony through ceaseless ages. Blistering in molten fire and brimstone. There's a sermon that Jonathan Edwards used to preach called sinners in the hands of an angry God. He would preach with such verbal power that people in the pews would fall down on their knees and say, "Please Pastor Edwards, no more. We can't take it, have mercy on us." Then the other extreme is, you heard some people here in Manhattan echo, "God is love. We're all going to make it, there is no punishment for the wicked." Between those two extremes, you'll find the Bible truth. The Bible does teach there is what we commonly think of hell, or a lake of fire, where the wicked will be punished, every man according to his works, but the Bible says it is not burning now, because the judgment has not taken place yet. The resurrection has not taken place yet. That's actually good news, Amen? Furthermore, the wicked do not burn in that lake of fire forever. Now you say, "Well, Doug, doesn't it say forever?" Yes. Stay with me, we're going to look at every scripture, and I invite all of your questions on this subject, but let's look at what the Bible teaches and believe the word of God. That sound fair?